These class time record files are only for those who either must or want to keep records of time spent in class. This form has space to record time spent in two classes. The form is set up for two 18-week semesters. The form is keyed to work with the high school semester planner and the high school quarter planner. The first row's keys are 1-I, 1-II, 1-III, 1-IV, and 1-V. Regarding the Roman numerals across the top of the 5 columns—They do not necessarily represent Monday, Tuesday, etc. The school days are meant to be stacked in the same way that days are stacked in a semester planner. Stacked as in one day after another with NO empty blocks in between. The keys basically function as a connection between forms and as a reference for grades when recorded. Using the keys is optional. This time sheet is donated by Crystal Goehrs. With it you can keep track of minutes spent for up to 3 children, for 8 different classes, and 190 days. 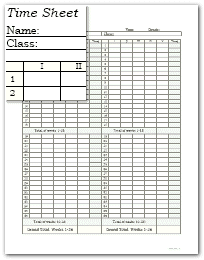 V Planner (a spreadsheet that requires Microsoft Excel) also has a time record function as well as attendance, scores, grades, classes, course of study, transcript, extracurricular activities, awards, and of course lesson plan management, the function for which it was initially designed. V planner is available with a Subscription to YoungMinds. V Planner can keep time for classes.